Every piece of information - idea - suggestion and routine has been independently created, developed, exploited and tested by the author some time or other. The reader is therefore assured, he is not getting any "second-hand" material in consequence. The colossal amount of material crammed between these covers, will provide the progressive manipulator with a wealth of valuable assets. The book has been divided into three parts. The first supplies detailed explanation for nearly forty new moves and passes. The second is kept apart for the creation of novel effects that are out of the hackneyed class. Nearly forty of these will be found. And lastly ten stirring routines make up the third part. 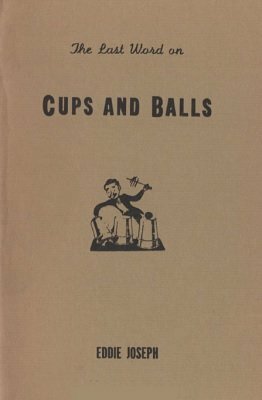 The Appealing Force of "Cups and Balls"
1st edition 1942, 69 pages; 1st digital edition 2016, 80 pages.